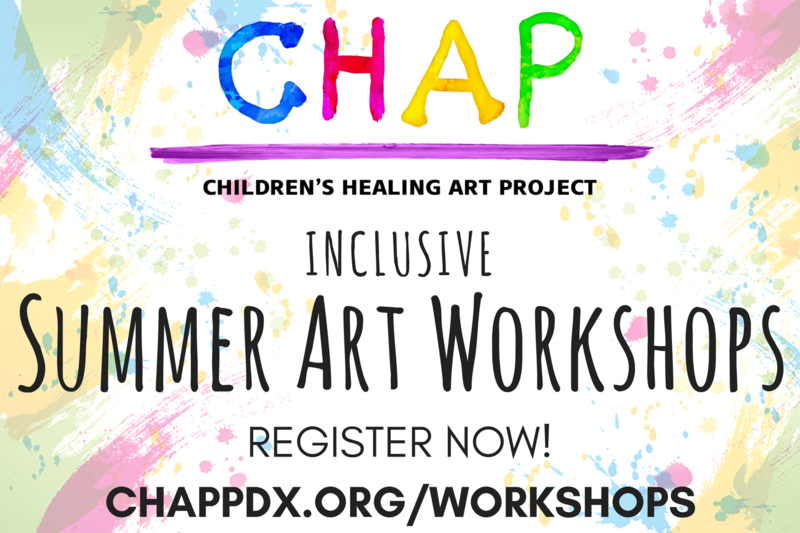 CHAP is excited to announce our fifth year of inclusive Summer Art Workshops open to the public! Children will experience a spectrum of projects and mediums in the fun and whimsical environment that is CHAP. Kids will have the opportunity to learn from a variety of skilled Guest Artists with diverse expertise, all while having the continuity of support from CHAP staff and volunteers. The daily three-hour art sessions are designed so children have the time to work wholeheartedly on their projects without experiencing creative fatigue. Time for snack and outdoor play is incorporated daily! The cost of a workshop covers art supplies and hours of fun, while also supporting CHAP in delivering innovative healing arts programs to critically ill, chronically ill and disabled children and their loved ones. 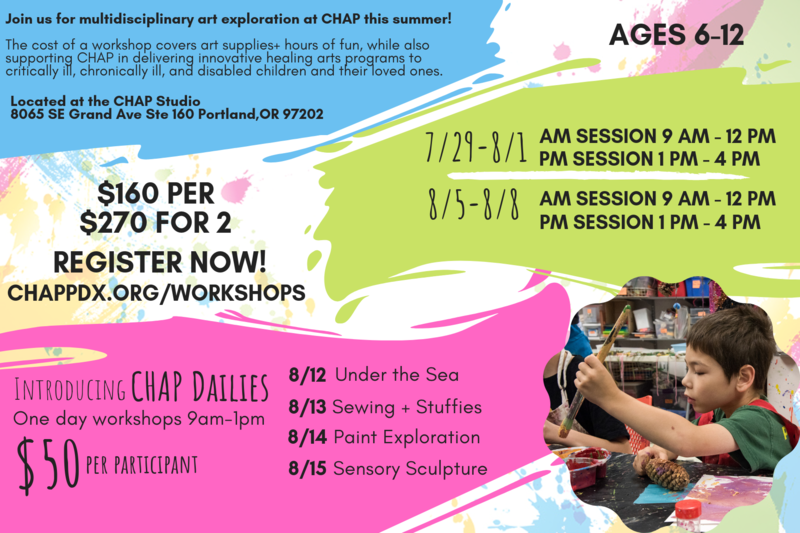 All workshops will be held at the CHAP Studio, located at 8065 SE Grand Ave Ste 160 (between SE Spokane + SE Tacoma) in the Sellwood neighborhood of Portland. You are welcome to sign up for more than one workshop. The first one is $160; if you sign up for a 2nd workshop, the cost for both is $270. Are you signing up for more than one Workshop? Mosaics, Cement Stepping Stones, Plaster Art, Air-Dry Clay, Cardboard Structures, + More! Paper Mache, Paint, Printmaking, Collage, Mixed Media, + More! Are you signing up more than one family member? You are welcome to sign siblings up for more than one workshop! Are you signing this participant up for more than one Workshop? You are welcome to sign siblings up for more than one workshop, at a cost of $125 per workshop. Anything else we should know? Please specify any allergies and/or triggers so we can be prepared. We'll email you to confirm registration and with any updates about the Workshop you've signed up for. Billing address same as contact address? If you have any questions, please call us at 503-243-5294 or email us at info@chappdx.org Thanks! If parents/guardians need to cancel, please let us know as soon as possible. A full refund, minus a $20 administrative fee, can be made if parents/guardians notify CHAP at least 7 days before selected workshop date. There are no refunds for unattended days.